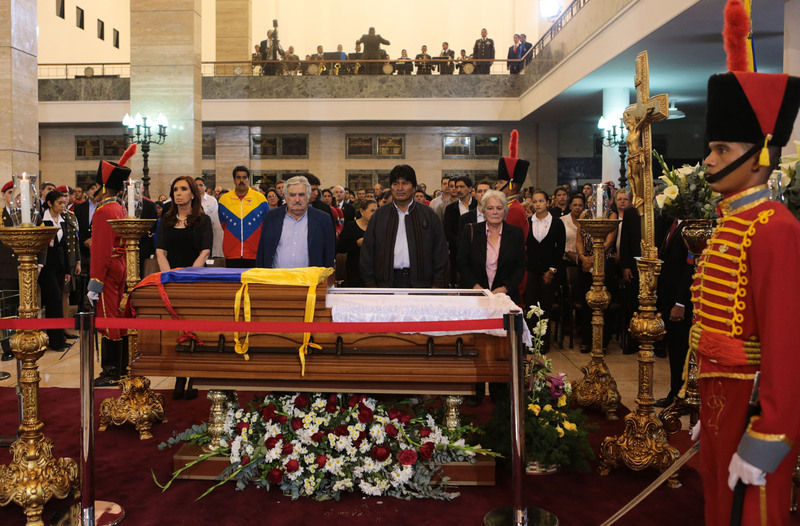 Hugo Chavez is still dead. But as Cornelius Fleischhaker notes, the Venezuelan economy isn’t yet. Despite Chavez’s best attempts to reform Venezuela into a Bolivarian socialist state, the country’s businesses have adapted to increasingly hostile realities to keep doing business. Although political succession rumblings are reaching a fever pitch, most Venezuelans rich and poor have their mind squarely on the economy, and where it’s going in the absence of its post prolific actor over the past fourteen years. There are a number of ways to create a more business friendly Venezuela, but before we can right the wrongs, we ought to address the persistent myths that plague our understanding of the Venezuelan economy. I begin with three common believes about the Venezuelan economy that are, in fact, myth. 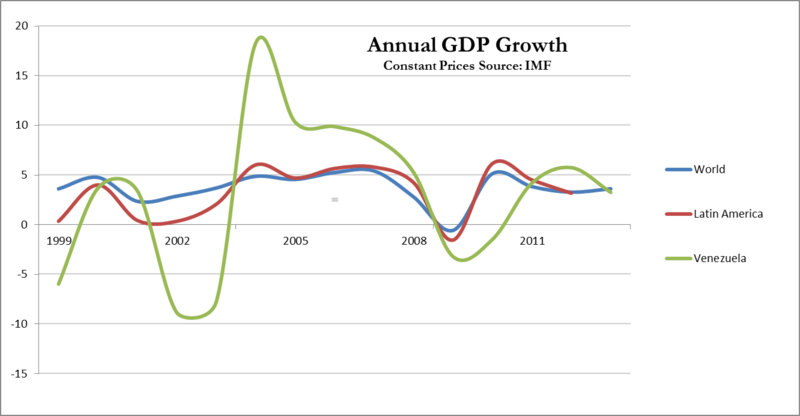 1) Venezuela has been in economic decline since Chavez took office. Despite persistently high inflation (running neck-and-neck with Argentina) over the past several years, real economic growth has puttered along at a slow pace, averaging 3.5 percent annually since Chavez assumed office. This figure betrays the vastly misallocated oil wealth the country has received, but no signs point to contraction. Under performing? Yes. Contracting? No. 2) All wealthy Venezuelans have left, and all big business too. Many wealthy Venezuelans, following in the footsteps of wealthy Cubans in the 1960s, sought returns abroad after the ascension of an anti-market leader. But there are still plenty of big business in Caracas, and lots of wealthy Venezuelans decided to ride out the crisis rather than flee to North America or Europe. Even the New York Times reports that, despite his public blusters, Chávez always ensured that trade valves between the US an Venezuela stayed open. While it must be said that many Venezuelans have gotten rich off “alignment” (read: corrupt deals) with the government. These “boliburgeses” have prospered in the vacuum of a true market economy. In this sense, Venezuela is not Cuba. It has a solid foundation and modern history of a market economy. That foundation has been battered, but it still exists. 3) The socialist model failed. According to the BBC’s report on Chavez’s death yesterday, the country now boasts the fairest income distribution in Latin America, as measured by the Gini coefficient index. In 2011, Venezuela’s Gini coefficient fell to 0.39. By way of comparison, Brazil’s was 0.52, in itself a historic low. So the question is not if it failed, but rather WHO it failed and who would have benefited from increased or steady inequality. Debunking these myths offers hope for Venezuelans, but one cold hard fact remains: The overall economy is a disaster. As observer and scholar Moises Naim wrote, Venezuela “has one of the world’s largest fiscal deficits, highest inflation rates, worst misalignment of the exchange rate, fastest-growing debt, and one of the most precipitous drops in productive capacity—including that of the critical oil sector. Moreover, during the Chávez era the nation fell to the bottom of the rankings that measure international competitiveness, ease of doing business, or attractiveness to foreign investors, while rising to the top of the list of the world’s most corrupt countries.” I do think Naim still likes arepas, though. 1) Things will start looking up if folks start looking down: Right beneath their feet, Venezuelans possess the world’s largest petroleum reserves. Estimated to last more than 300 years at current levels of production, the country has the capability for permanent fiscal stimulus and resource security larger than even the United States. Yet the country imports gasoline, and loses money on PDVSA, the state-run oil company. Due to restrictions on domestic prices, free oil giveaways to political allies during Chavez’s term in office, pricing and marketing restrictions from its participation in OPEC, and most importantly crumbling or nonexistent infrastructure for advanced extraction and refining, PDVSA posts US$6 billion+ in cash losses per year on what should be the crown jewel of the government’s coffers. The government is also entirely dependent on oil exports at current prices to fund its obligations. Oil exports represent 90 percent of the country’s foreign currency inflows, and nearly 50 percent of total government revenues, meaning that the government is extremely vulnerable to price swings and heavily dependent on an inefficient sector of the economy. There are two steps Venezuela can take to change this path to perdition. The first would be to invest heavily in reforming PDVSA, creating a more efficient state company and domestic refinery capacity to blunt the losses from importing finished fuels. The second would be to cut subsidies on gasoline in the country which, given the importation of expensive refined gasoline and next-to-free prices, would give PDVSA, and the government, breathing room in its energy budget. Finally, many countries in the region, particularly in Central America and the Caribbean, are dependent on “petrodiplomacy” – the free or subsidized oil meted by Chávez under the Petrocaribe program. While it would be traumatic for recipient countries, stemming this largess would be a way for Venezuela to shore up its finances. 2) A commitment to law and order. Veneuzela, and particularly Caracas, suffer from one of the world’s highest rates of murder and assault. This is a major quality of life issue, but it also is a quality of economy issue. Foreign and local businesses have been scared off by reports that it is no longer safe to don a business suit in Caracas, let alone conduct business. A return to law and order, and a distancing from Chavez’s policies equating imprisonment for criminal offences toward repression of the poor, would go a long way to restoring confidence in the Venezuelan opportunity. Security improvement comes with a price tag, but one that Venezuela should be able to foot if it were to earn the true value of its hydrocarbons. 3) Rapprochement with the United States. The US is Venezuela’s largest trading partner, in good times and bad. Chavez’s saber-rattling did little more than energize a base of anti-U.S. sentiment in Latin America and put a bee in Washington’s bonnet. This is not a call for a fundamental realignment of interests for the country, but in order to get its economy back on track, it should begin relying on healthy trade relationships and diversified exports rather than a passive-aggressive addiction to oil exports and unproductive domestic industries. Better trade and relations with the U.S. (and to some extent, Brazil) would be an ideological step towards accomplishing this goal. None of this will happen overnight, particularly if Nicolas Maduro (not to be confused with toston) drags out Chavismo a-la-Raul Castro. But Venezuelans in all echelons of society recognize that things need to change and that now is a historic moment to do so. This entry was posted in Andean Region and tagged Chavez, Economy, Maduro, PDVSA, Venezuela. Bookmark the permalink. Propaganda from another rich quisling.